Lauren St John's stunning Christmas classic is about forgotten children, the power of nature to heal us and a girl who will climb mountains in search for a place to call home. Growing up in vibrant, crowded Nairobi, Makena has only one dream: to climb Mount Kenya like her hero, her mountain guide father. But when her beautiful world is shattered, she finds that in the city's dark places there are a thousand ways to fall, each more deadly than any crevasse. In a world of strangers, does she dare trust Snow, whose ballet dreams are haunted by a past she's still running from? And is the sparkling fox friend or foe? After a fresh start in the Scottish Highlands turns bad, Makena flees to the mountains. But will they betray her or be the making of her? Award-winning writer Lauren St John is the author of children’s books including The White Giraffe series, the Laura Marlin Mysteries (which began with Blue Peter Book of the Year Award-winning novel Dead Man’s Cove) and The One Dollar Horse series. 'An absolute triumph. A hymn to mountains, lost children and kind hearts. Tenderly told and fierce in its quest for hope' Abi Elphinstone, author of The Dreamsnatcher. 'A glorious story of loss, refuge, home, heart, snow and mountains. I loved it' Katherine Rundell, author of Rooftoppers. 'Loaded with mountain-climbing, wild animals, survival skills and bags of hope' The Times, Books of the Year. 'A powerful thread of hope and humanity shines through the story, transforming it into something utterly life-affirming ... Cornish artist Catherine Hyde's full-page illustrations elevate The Snow Angel into an exceptionally beautiful gift book, lending shape and atmosphere to the magic glimmering beneath the words of this modern-day fairytale' Observer. 'A great story, easy to read, and swiftly devoured' MinervaReads. 'A life-affirming and moving story which packs a similar emotional punch to a Michael Morpurgo novel ... Compelling and compassionate' Books for Keeps. 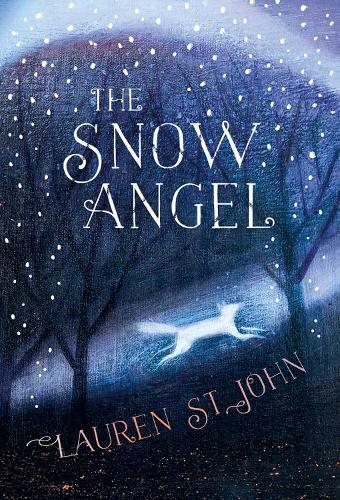 'Beautifully written ... Any review of The Snow Angel wouldn't be complete without a special mention of the black and white illustrations by Catherine Hyde which effectively evoke emotion and add to the book's mystical atmosphere' The Bookbag. 'Everything about this book [...] will make you feel good' Cliff McNish, author of Breathe. 'A beautiful story that will stay with me for a long time. Lauren St John is such a wonderful writer and Catherine Hyde's illustrations are stunning' Christopher Edge, author of The Jamie Drake Equation. 'A powerful modern day fairytale about the strength of the human spirit, the power of friendship and beauty of nature [with] gorgeous, full-page illustrations' Muddy Stilettos. 'If the spirit of Christmas is kindness and compassion, The Snow Angel could not be more appropriate reading' The Sunday Times Book of the Year. 'Uplifting, and a reminder of nature's healing power' Herald. 'Tender and fierce storytelling, a perfect Christmas read for teens' Western Morning News. 'Catherine Hyde's black-and-white illustrations add to the sense of magic that Lauren St John creates in her descriptions of the African and Scottish landscapes ... Readers will finish this book more aware of the little things we can do to make the world a better place for everyone' BookTrust. 'This remarkable book [is] a fable as much as it is a fast-paced adventure, and its huge heart pulses at the centre of the action, meaning that however hard Makena's life becomes, there's always hope' Katherine Rundell, Waterstone's blog. 'A beautiful modern fairy tale of snow, mountains and magic' The Week Junior. 'Catherine Hyde's beautiful illustrations also add a touch of magic to this tale, helping to transform it into a modern-day fairytale that deserves to become a modern-day classic' Childtastic Books. 'Lauren St John has a gorgeous descriptive writing style that captivated me from the start. She tells her story, with warmth, empathy and honesty ... It's a fantastic story that I highly recommend' With Love for Books. 'Lauren St John has created amazing landscapes, peopled by extraordinary characters ... Beautifully illustrated by Catherine Hyde, this is a heart-warming story of memory and loss, finding and renewal' The School Librarian.